RoyalEnfields.com: Royal Enfield racer not beautiful, but is it beastly? Royal Enfield racer not beautiful, but is it beastly? 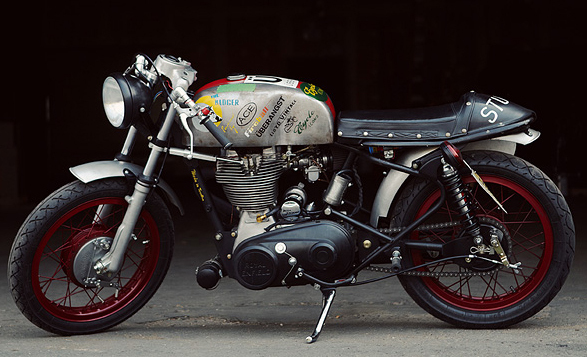 The Badger, a Royal Enfield built to ride and then race. 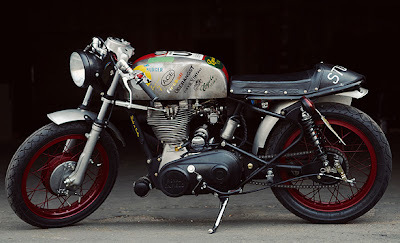 ﻿The Badger, a Royal Enfield that raced at Mid-Ohio after being ridden there on its own two wheels, is the subject of an article in the well regarded Bike EXIF blog. The author details the history of this experiment in riding and racing and calls the Badger a "raw and curiously appealing machine." Judging by the comments, some readers found it raw and distinctly unappealing. One wrote that it "it looks to be done with scraps and rattle cans. Not that that's a bad thing. It has its place, for sure." To which another responded that "It has a place on the scrap heap." That seems pretty harsh, especially in light of the lovely photographs on Bike EXIF. That naked steel tank bearing the Badger logo earns some praise from other readers. The Badger was the brainchild of Leon Stanley of Cycle Icons, in Trenton, N.J. But the plan to ride it to races and then compete on the track has brought together a whole team (including a film crew) built around the Badger. Bike EXIF is the work of Chris Hunter, a Brit who lives in Sydney, Australia. EXIF stands for Exchangeable Image File format, the data captured by a digital camera when a photo is taken. Not surprisingly, the blog features a seemingly endless stream of lovely pictures. Of which The Badger is only the latest. What do you think? why count rivets on a machine built to the purpose of racing? Agree the machine isn't looking period or beautiful. May be a photoshoot with usual Enfield gas tank & casquette (unpainted? )would give the wishful vintage looks. Wow, it is beatiful... A bike to ride & have fun. Great job. The Badger is not a show pony,unlike many of the bikes on Exif. It's got a wonderful back story to it that complements the look of the motorcycle that is ridden to the races and then back home. I think it looks fantastic with it's pared-down raw look and to get 38bhp out of a cast iron Bullet is no mean feat too. Go Badger, go!